The hottest matter that existed in the early universe after the Big Bang is created in collisions of high-energy nuclei. Using information on the propagation and attenuation of fast particles coming from the collisions, nuclear physicists can extract transport properties of the hot, dense matter. The extracted jet transport coefficients, which have the highest precision to date, show how well the quark-gluon plasma (QGP) can transfer momentum and energy within its bulk. This result will lead to a much better understanding of the plasma constituents and properties. Heavy nuclei are accelerated to nearly the speed of light and collide with each other to create a new state of matter called QGP that only existed in the early universe shortly after the Big Bang. 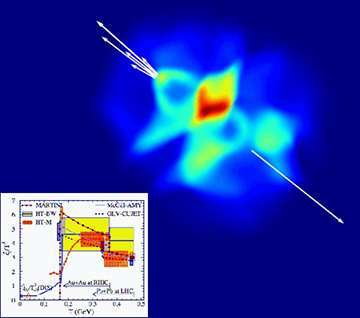 The JET Topical Collaboration, funded by Department of Energy and lead by the Department of Energy's Lawrence Berkeley National Laboratory, investigated properties of QGP using information on fast particles, which are produced early in the collision and propagate through the plasma—much like a CAT scan in medical imaging. Combining theoretical modeling with data from experiments at the Relativistic Heavy-Ion Collider at Brookhaven National Lab and the Large Hadron Collider at CERN, the JET Collaboration has successfully extracted the jet transport coefficient of the QGP with high precision and carefully quantified uncertainties. This shows how future studies of QGP properties can reach even higher levels of precision and sheds light on the mechanism causing the liquid-like nature of the plasma created in high-energy heavy-ion collisions.